Older than dirt. Grew up camping, hiking, found a sweetie who likes it too. 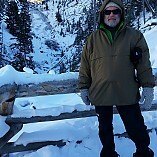 Been X country skiing for 40 years, snowshoeing 20 years. Live in Montana on two acres of mountain, three hours from Yellowstone and three from Glacier. Have the truck to get most anywhere, love equipment. Buy expensive equipment not because it is cool, but because quality is noticeable in harsh environments but leaven in older approaches because they work.